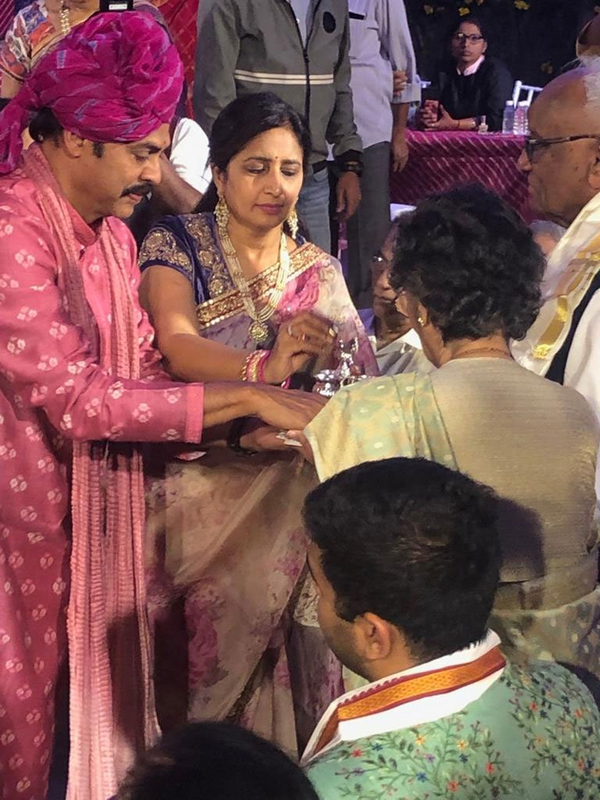 It is known that Venkatesh daughter, Aashritha's wedding took place recently as a star-studded event in Jaipur, Rajasthan. The adorable wedding photos have been going viral on the internet. Ashritha looked gorgeous in her silk wedding saree and her simplicity has been grabbing the attention. Apart from Ashritha, the special person who also stole the limelight is Aashritha's mother, Neeraja Daggubati. It is known that Venkatesh's wife rarely gets into media space and even her pics were also kept under the wraps. Now, she was caught by the camera while she was busy performing the wedding rituals along with her husband Venkatesh. The pics of Venky with his wife have been impressing the audience. She is looking simple and their pair looked adorable. Daggubati fans are happy to see her and Venky together extremely happy at the wedding. The who's who of Tollywood marked their presence at the wedding.